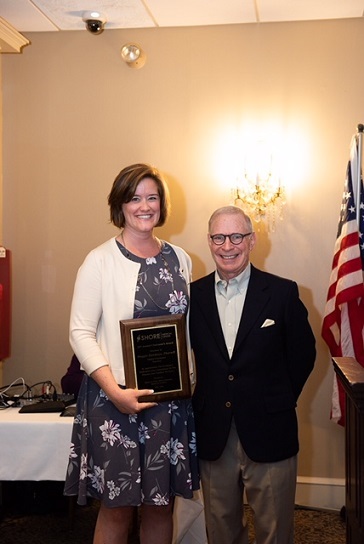 Shore’s Cancer Community Outreach Manager Angela Bailey, MSW, LSW, of Galloway, was presented with the 2018 DiOrio Award for her leadership and life-saving work in cancer prevention, education, and outreach. Janet DiOrio Galante presented the award, which was established in honor of her father, Joe DiOrio, a trustee of the medical center for over 50 years. DiOrio Award – Angela Bailey, MSW, LSW, Cancer Community Outreach Manager: Bailey was recognized for her role in a variety of community initiatives that help save lives, including the implementation of the New Jersey Comprehensive Cancer Control Plan in Atlantic and Cape May counties; outreach, education and screening services for breast, cervical, colorectal and prostate cancers; and, her engagement of healthcare providers and the public in partnering on projects designed to reduce the incidence of chronic disease. The award was established in honor of Joe DiOrio, a Shore trustee for a half century and a role model for civic engagement. 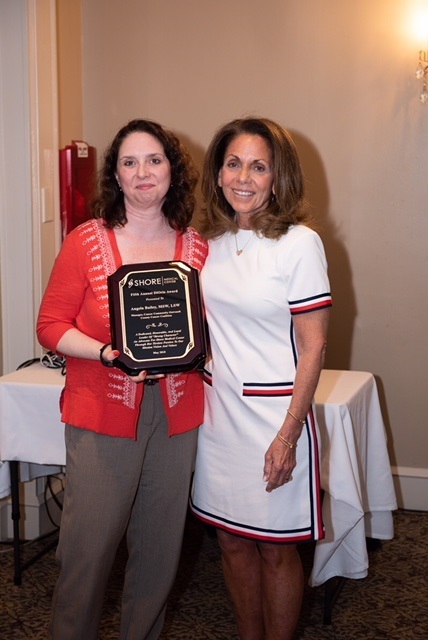 Shore Clinical Pharmacy Coordinator Maggie Randazzo, PharmD, BCPS, of Linwood, received the 2018 Chairman’s Award for Clinical Staff for her relentless pursuit of personal and professional success and for always raising the bar for excellence. The award was presented by Shore Board chairman Dr. Robert Bray. Chairman’s Award for Clinical Staff – Maggie Randazzo, PharmD, BCPS, Clinical Pharmacy Coordinator: Randazzo was honored for her relentless pursuit of personal and professional success and for being an ambassador for Shore whose passion for her field is exceeded only by her desire to better Shore’s healing environment. 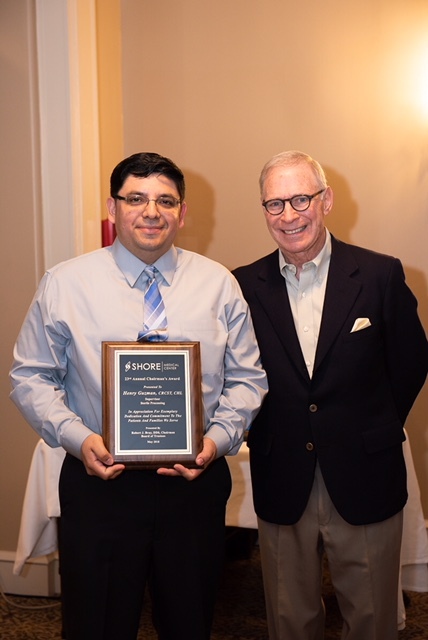 Shore Sterile Processing Supervisor Henry Guzman, CRCST, CHL, of Egg Harbor Township, received the 2018 Chairman’s Award for Non-Clinical Staff for his precision and singular focus in ensuring that every item that comes in contact with patients is clean, free of infection an prepared for use. Chairman’s Award for Non Clinical Staff – Henry Guzman, CRCST, CHL, Sterile Processing Supervisor: Guzman was recognized for his precision and singular focus in ensuring that every item that comes in contact with patients is clean, free of infection an prepared for use. 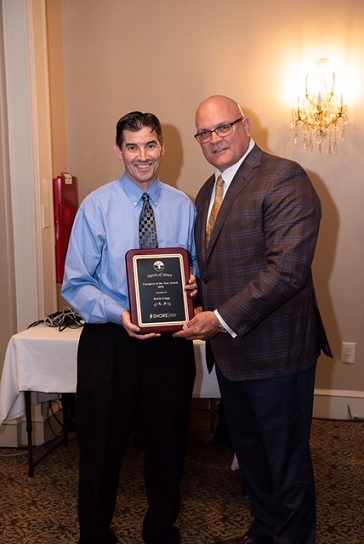 Shore Experience Coordinator/Internal Communications Specialist Kevin Clapp, of Mays Landing, received the 2018 Caregiver of the Year Award for the care and support he provides everyone he interacts with, from new employees and colleagues to patients and families. Shore President and CEO Ron Johnson, right, presented the award. Caregiver of the Year – Kevin Clapp, Experience Coordinator/Internal Communications Specialist: Clapp was recognized for the care and support he provides everyone he interacts with, from new employees in orientation and his colleagues in every department, to the patients and families he impacts through his role on the Patient Experience team. In addition to these four annual awards, Shore Medical Center presented its Leadership Profile Award to Joseph Johnston, administrative director of oncology services, and its May Employee of the Month award to Rosemary Dowling, staff assistant in the HIMS department. Shore’s Anti-Microbial Stewardship Team was also recognized for its impact on improving safe antibiotic usage. 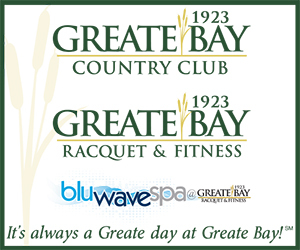 An additional award, Spirit of Shore Physician Champion of the Year, will be presented at a later date. At Shore Medical Center, located in Somers Point, NJ, kindness complements an extraordinary level of clinical sophistication. People are the foundation of this modern medical center where advanced technology harmonizes with compassionate care. Shore Medical Center attracts the area’s best physicians, nurses and clinicians, and is the first and only hospital in New Jersey and one of 86 healthcare organizations worldwide to earn Designation as a Planetree Patient-Centered Care Hospital®. Recognized for its dedication to patient safety, Shore has received eight consecutive “A” grades in The Leapfrog Group’s Hospital Safety Score since Fall 2014. Shore Medical Center is home to six Centers of Excellence for Cancer, Cardiovascular, Neurosciences, Spine and Orthopedic, Emergency and Maternity and Pediatric care. Shore’s affiliations include Penn Medicine, Onsite Neonatal Partners, St. Christopher’s Hospital for Children, Mayo Medical Laboratories, and Advanced Radiology Solutions. 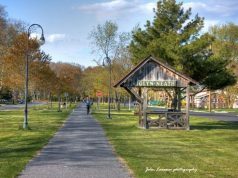 In addition, Shore is a member of the Jefferson Neuroscience Network and has physicians on staff from the Rothman Institute. 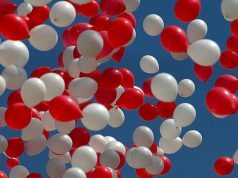 In 2011, Shore opened its Pediatric Care Center, the first of its kind in New Jersey, and its state-of-the-art Surgical Pavilion and Campus Expansion. 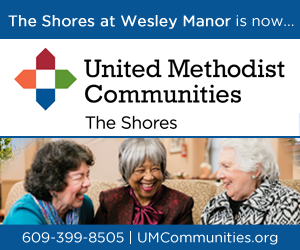 The Shore Medical Center Planned Giving & Development team, which includes the Auxiliary, creates and implements dynamic philanthropic programs that support the mission of Shore Medical Center (www.GivetoShore.org). 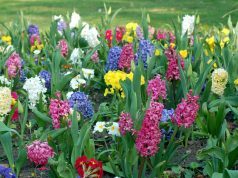 For more information about Shore Medical Center, visit www.ShoreMedicalCenter.org.